OpenRoad Auto Group wins Canadian automotive retail Innovator of the Year and celebrates with the opening of a new Infiniti store. BRITISH COLUMBIA, July 27, 2012 /CNW/ - OpenRoad Auto Group Ltd., a market-leading car retail and service centre group, showed today that innovation is equal parts market insight and action. OpenRoad president, Christian Chia, was recognized by the highest board of recognition in the automotive industry - the Canadian Automobile Dealers Association - as he was awarded the 2012 Innovator of the Year. Accepting his award, Chia said, "The time for a better guest experience is something we at OpenRoad have been chasing in earnest for the last few years now. From a few new flagship LEED-certified facilities, to back-to-back top ten rankings as the Best Employer in Canada, our commitment to improving the guest experience is receiving recognition, and I am thrilled to accept this on behalf of OpenRoad." Innovation in the category of automotive retailing is a challenging endeavour. With a significant commitment to improved guest facilities, customer events, more open customer dialogue both online and in-store, OpenRoad is standing out as a modern car retailer. In the same breath of accepting the award, Chia noted, "We are currently focused on opening a boutique Infiniti dealership in Langley. Infiniti is taking a different approach to luxury, and similarly for us at OpenRoad, we want to take a different approach to automotive retail." Open on July 27th, 2012 OpenRoad Infiniti is located in the new luxury auto mall - Langley Auto Collection - and is situated next to another OpenRoad store, BMW/MINI Langley, opened last summer, and Gold Key Audi, which is under construction. OpenRoad Infiniti celebrates its opening with two exciting events in early September. Experience the excitement of F1 racing as the Red Bull F1 Show Car makes its final pit stop in Canada at the store on September 4th to 6th, 2012. During that same weekend, on September 7th and 8th, the public are invited to an Open House event featuring local wine, artisan cheeses and entertainment. Developing a collaborative, hard-working and fun workplace culture has also been an important part of OpenRoad's ongoing effort to improve the guest experience. "The industry still has a negative stigma attached to it," said Chia. Earlier this year, OpenRoad introduced its very own loyalty program, Club OpenRoad, as one of its many initiatives to align new car purchases with a car dealer experience that focuses on relationship-building and added value. OpenRoad Auto Group Ltd is a Canadian automotive retailer representing 10 import automotive brands. 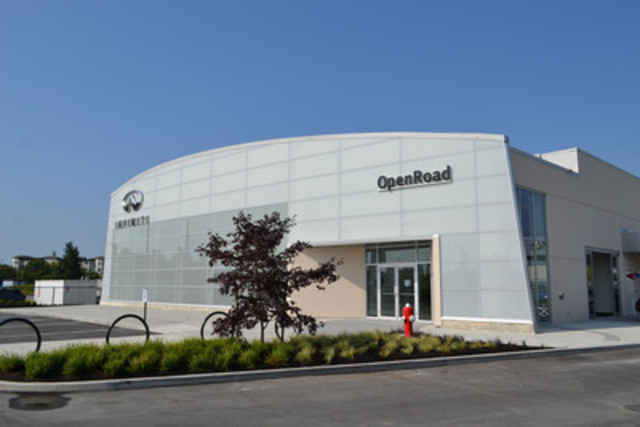 With over 100,000 customers choosing OpenRoad to purchase or service their vehicle, OpenRoad has established itself as one of the most progressive car retailers in Canada. A top 10 Best Employer in 2011 and 2012 and a reputation for informative and participative guest events, OpenRoad Auto Group facilities and staff provide a professional, respectful and well-informed place to purchase or service a car.